It’s believed that those born between the years 1982 and 2004, commonly referred to as Millennials, will make up 75% of the workforce within the next 10 years. 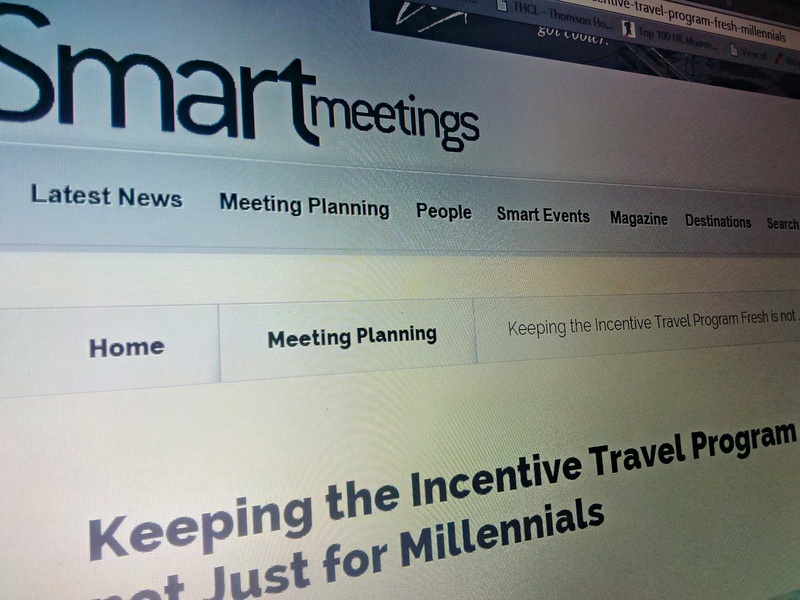 These social media babies, tethered to Smartphones and weaned on instant gratification, are ripe for experiences and adventures which will challenge meeting planners when building future sales incentive travel programs. But no matter the demographic they are targeting, incentive travel programs always need to stay fresh. Because those who refuse to keep moving forward in this business aren’t standing still, they’re actually going backwards. Don’t be afraid to push the envelope, and never ever automatically assume that someone won’t enjoy doing something. You may be surprised. A number of years ago for an incentive travel program in Costa Rica we decided to include a zip line tour. Keep in mind at that time zip line tours were not as common as they are now. No one in our group had ever done a zip line in the past so it was definitely a novelty. The group ages ran from 20’s to 60’s and there was some concern that the older members of the group would not partake. The platforms were very high up in the trees and I could tell during the instruction phase that some members of the group, both young and old, were starting to look a little pale. However, no one backed out. By the time the 40-member group had completed the course, there was a heightened sense of excitement. One couple who had been on all past trips thought this was the greatest ice breaker ever. The Tarzan calls could be heard throughout the jungle and everyone mingled and cheered each other on. We kept this camaraderie going with an outdoor barbeque dinner, open bar and a great band. They literally danced the night away. Many times when options are presented to an incentive client, it’s a good idea to include a wild card or two. A wild card is something different from the usual program profile. It doesn’t have to be completely off the charts—not everyone may enjoy wrestling alligators—but have some fun with it. Make it memorable. One time we had a client request an incentive program that included a four-night stay at a warm weather golf destination in the Caribbean. A pretty standard request as a destination. We decided it needed a wild card to really amp up the interest of the sales team. When the head of sales announced instead that the destination for the following year’s trip would be Paris, the sales team erupted in yelling and screaming worthy of the 1927 landing of Charles Lindbergh. The contest wouldn’t be for another 10 months or so, but that excitement never waned. Even though we had to make some adjustments to the program to fit the budget, no one had any complaints. The program was such a huge success that it changed the destination profile for the future. Another example of thinking outside the incentive box occurred when a Massachusetts-based company enticingly dangled a huge carrot in front of their prospective sales incentive winners – the use of a $70,000 Porsche sports car for one year for all those that qualified. On the day the winners were announced, the client lined up 20 Porsches of all different colors outside the corporate headquarters ready for their lucky winners to jump into. This “out of the box” prize for increasing sales drew nationwide TV coverage for its ingenuity and great excitement for those that made their quota. It increased sales and garnered phenomenal PR as an added bonus. But don’t be intimated by the price-tag, I am guessing your incentive leaders would be just as happy tooling around town in a more budget palpable $30,000 Ford Mustang. Although most people would love visiting Paris, and who wouldn’t enjoy pulling up in front of their high school reunion in a glittering Porsche, there are numerous other creative ideas that can be included to make your sales incentive program a little more unique and yet cost effective for your budget. Consider changing up your program a little. Instead of a golf tournament during the day how about an evening golf tournament; putting under the lights. Or perhaps combine a fun incentive with some humanitarian efforts. Your group can still have a ball enjoying Mardi Gras in New Orleans while also remembering the thousands who were affected, and are still affected by Hurricane Katrina. Take the time between dancing in the streets and enjoying jambalaya by chipping in to help rebuild a home—and a life—that was ravished by Mother Nature. It’s a win-win for your employees, and your company.